This week we are excited to introduce you to another of our fabulous Hudson’s couples. We’re privileged to host weddings for a hugely diverse range of couples from all over the world. We love getting to know our clients and becoming part of their story. 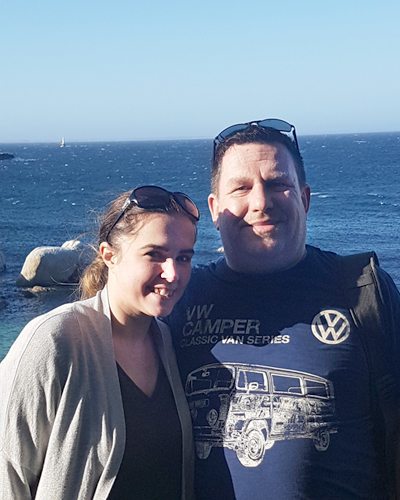 This couple reside in the UK so we asked them about their reasons for choosing South Africa and us in particular. Meet our future bride and groom Zara Stewart and Matt Whitticombe who will say “I do” at Hudson’s venue on Friday 8th November 2019. Zara told us their tale so far. We met at work almost a year ago. We both work in security at a UK airport. Matt invited me on a “staff night out”. I think this was just to have an excuse to add me as a Facebook friend! The night out turned out to just be the two of us. As we both had to work on Christmas day last year we decided to exchange gifts two days early. I love jigsaw puzzles so Matt gave me a tough one. On the puzzle were thousands of stones and just one diamond. I said out loud, “I wonder where the diamond is”. Matt responded, “In my pocket”. I didn’t believe him at first as he can be sarcastic! The next moment he pulled out the ring and proposed. Initially I said I wanted a beach wedding. As Matt has family in Cape Town he immediately suggested a destination wedding. We began searching for beach locations but this soon proved difficult so we widened our criteria to include other options and eventually planned a trip to South Africa to visit venues. Hudson’s was the first place we went to on our last day hunting. We instantly fell in love! It offers so much more than other venues and yet is better value for money. Be sure to visit your venue before actually booking! We arrived at so many venues only to find that they looked completely different to how they’d appeared online. We’re excited about celebrating our special day with close family and friends at such a beautiful venue. We’re looking forward the most to saying vows next to the lake with views of the mountains. We can’t wait to host Zara & Matt’s big day. To get excited about planning your wedding with us get in touch to schedule a viewing.